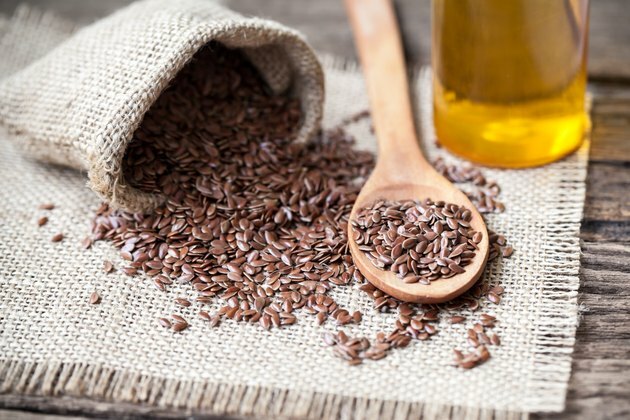 Does Flaxseed Oil Make You Gain Weight? If you're trying to gain weight, flaxseed oil provides you with essential fatty acids as well as additional calories. Flaxseed comes from the pressed seeds of the flax plant, and you can add it to smoothies, drizzle it on top of cereal or mix it into a salad dressing. Avoid cooking with flaxseed oil, though, as heat destroys the healthful essential fatty acids and could actually make them toxic. Flaxseed oil can become part of a weight-gain program, along with other healthy, calorie-dense additions to your diet. You gain weight when your calorie intake exceeds your calorie burn. Flaxseed oil can help you add calories, but it will cause weight gain only if that addition makes you exceed your calorie needs for the day. A healthy calorie surplus is about 250 to 500 calories per day to result in a 1/2 to 1 pound gain of weight per week. A tablespoon of flaxseed oil adds 120 calories to a smoothie or salad. If you add three tablespoons over the course of a day, that's 360 extra calories, or enough to gain about two-thirds of a pound per week. The omega-3 fatty acids in flaxseed are superior to the saturated fats found in most animal foods. You get alpha-linolenic acid, or ALA, from flaxseeds. Your body converts some of the ALA into eicosapentaenoic acid, or EPA, and docosahexaenoic acid, or DHA, which are the types of fatty acids found in fish oil. The regular consumption of these fatty acids from flaxseed oil may protect against heart disease, high cholesterol and some forms of cancer. Omega-3 fats are also important for brain health and to fight inflammation. Fat, as a food, has 9 calories per gram, compared to the 4 calories per gram of carbohydrates or protein. If you have a poor appetite, adding flaxseed oil to yogurt or oatmeal adds calories without making you feel stuffed. Although flaxseed oil is a positive way to add calories, vary your source of extra calories to gain weight in the healthiest way possible. Added protein, for example, from an extra serving of chicken, a scoop of whey protein, cottage cheese or canned tuna supports muscle growth -- especially if you're trying to gain weight with strength training. Starchy vegetables, whole grains, nuts and nut butter, dairy and fruits also add calories on a weight-gain plan. Other healthy fats, such as avocado and olive oil, provide additional calories a variety of flavors, too. Adding as many nutrients as possible promotes your energy levels, enhances immunity and contributes to healthy skin and hair. To pack on pounds, you need to consume calories over and beyond what it takes for you to maintain your weight. If you find that flaxseed oil interferes with sensations of hunger, it may be a counterproductive way to gain weight. If you're concerned that a tablespoon of flaxseed oil is going to cause you to gain weight when you don't want to, make sure you account for it in your daily calorie count for the day. Use it instead of olive oil in your salad dressing or add a tablespoon to a smoothie instead of almond butter. If you add even a tablespoon to what you eat now to maintain your weight, it can cause you to gain 10 pounds or more in a year's time.